This 2 min show, which includes a 1 min song, is absolutely pointless. There are so many other shows to choose from that were released this season and yet CR chose this one. :| Very disappointed. The characters are speaking so fast to try to squeeze in the entire show in 1 minute. Absolutely pointless! The entire anime is just sped up ridiculousness. I think they probably should have forgone the opening to make this have some time to set up the punchlines better. It is kinda hard to enjoy the ludicrousness when literally so much of it happens that you cannot possibly keep up with it, or spend any time enjoying the spontaneous nature of the insanity. Not terrible, but don't go in expecting anything. Seriously now, this anime made me laugh, it was a terrible 2 minute wonder but it was definetly chuckle worthy compared to the more recent animes that have come out. Give it a watch, im sure you can spare 2 minutes of your life. The show is cute and could be funny, if it wasn't so fast. Everything is going at such a hyper speed that you really don't have time for the joke to be funny. You get a speedy setup, then right to the punchline, quickly followed by more dialogue. Cute idea, but zero time to enjoy it. If you have never attempted to watch Teekyu, then you may not understand Takamiya Nasuno Desu! The speed of the dialog is par for the course and since it is so short you can watch it over and over to the point of memorizing it and understanding it. I know a whole 2 minute single eps. is hard to judge a show, but if you like Teekyu you will like this. Way too short to enjoy. Why make a 2 minute show with a 1 minute OP then have the rest go at a million miles an hour? It might have been funny if even 1 minute longer. And, slightly off topic, why does CR treat the UK differently to the US? We pay just as much but have to go to other sites to view the best shows of each season. So unfair. Also really tired of harems. Sorry guys but they stink. I thought her dress looked like a bunch of bananas. Needless to say, I was disappointed. 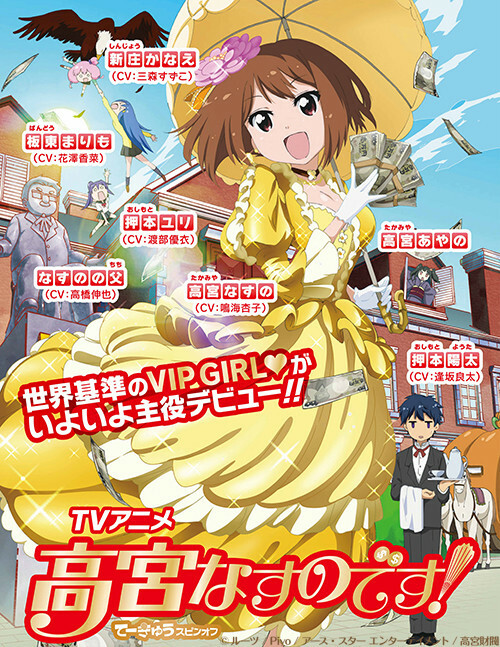 What if there was an anime about a girl in a dress made of bananas with tons of cash to throw around? Would you watch that? I know I would, and I think that's what really matters. So for the first episode we get the set up of Yuri's(of Teekyu) brother becoming Nasuno's butler. It was funny and fast as usual for Teekyu. I hope the other three girls don't show up too often as this is Nasuno's show. I hope Marimo gets her own series too. Any comments saying that the show is a waste of time are very busy people who can't spare two mintues. I like this show. I feel a lot of the people who rated it poorly did not know what they were getting into from the start. If you haven't watched Teekyu you are already a step behind, but the shows don't really draw on each other. Its more along the lines of the style or genre that you are behind on so don't be discouraged. Is it short? Yes, it is about 2 mins. Is it fast paced? Yes extremely. it has to be. Is it funny? I feel like it is. They set up a joke and BOOM punchline...Next joke...A lot of the comedy is nonsense so be prepared for confusion. But at least go in with an open mind and don't expect it to be confined to a "normal anime". I'm a fan of humor. I saw this show and liked the high paced humor packed in such short segments. This show is a spinoff of Teekyu, which has this same type of high-paced comedy packed within two minute episodes. This show is NOT anything like Attack on Titan or something. It's just... funny. Personally I like the length. It enables me to get in a quick laugh if I want to watch something yet I don't have time for a full anime episode. These episodes remind me of the 4-koma manga comedies I've read. This is the first time I've seen 4-koma nearly replicated in anime like this. It's refreshing. This show led me to Teekyu as a bonus. I have no complaints. Teekyu's Takamiya Nasuno is the star of her very own spin-off series in Takamiya Nasuno Desu!